Adriane Darcy was practically raised in her father's newspaper offices. She can't imagine life without the clatter of the press and the push to be first to write the news that matters. Their Tribune is the leading paper in Louisville in 1855. Then Blake Garrett, a brash young editor from the North with a controversial new style of reporting, takes over failing competitor the Herald, and the battle for readers gets fierce. When Adriane and Blake meet at a benefit tea, their surprising mutual attraction is hard to ignore. Still, Blake is the enemy, and Adriane is engaged to the son of a powerful businessman who holds the keys to the Tribune's future. Blake will stop at almost nothing to get the story—and the girl. Can he do both before it's too late? Set against the volatile backdrop of political and civil unrest in 1850s Louisville, this exciting story of love and loyalty will hold readers in its grip until the very last page. Bestselling author Ann H. Gabhart once again delivers an enthralling and enduring tale for her loyal and ever-expanding fan base. I really enjoyed this author's books set in the fictional Shaker village, so I was excited to read this book set in 1800's Louisville. However, this book just didn't have enough to differentiate it from the crowd of Christian historical fiction for me. It was a solid historical tale, and I appreciated the subtle Christian message that was never overbearing. It just didn't have the oomph that I expected. The historical setting and newspaper business definitely takes over more of the story than the romance. I enjoyed the romance, but it seemed like a backburner plot. Blake seemed like a really stand up kind of guy, so I would have liked to have known more about him, maybe then he wouldn't have seemed so cookie cutter to me. Bottom Line: A solid historical, but I would recommend this one to fans of rich historical details and setting as opposed to historical romance. 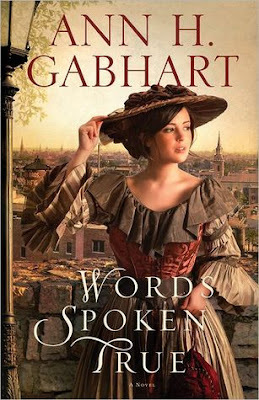 Check out a great contest for Words Spoken True on Ann H. Gabhart's site! Oh! I'm afraid that though I enjoy a good settling, I do need romance to be the focus. So I'll put this in the maybe pile. I like de cover though and I'm glad the Christian Message wasn't too much. I'm getting that "not distiguishable" vibe from a lot of CF historicals these days. I used to love that genre too, but I think I need a break. Beautiful cover on this one though. Seems like this is nothing special. Thanks for the great review! DVD Review and Giveaway! "The Mighty Macs"